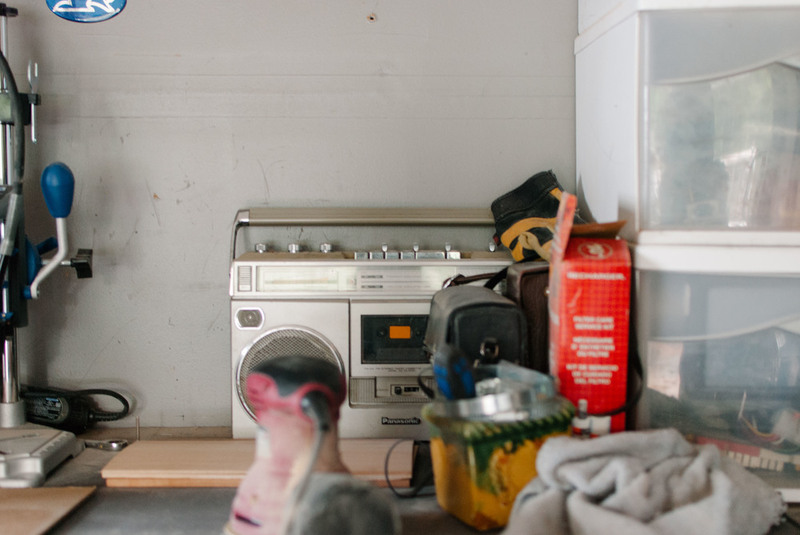 It's been a while since I've posted another installment for the In Their Element series I've been working on, which features artists and the spaces they create in. If you didn't catch some of the other ones I posted last year, you can view all of them here. 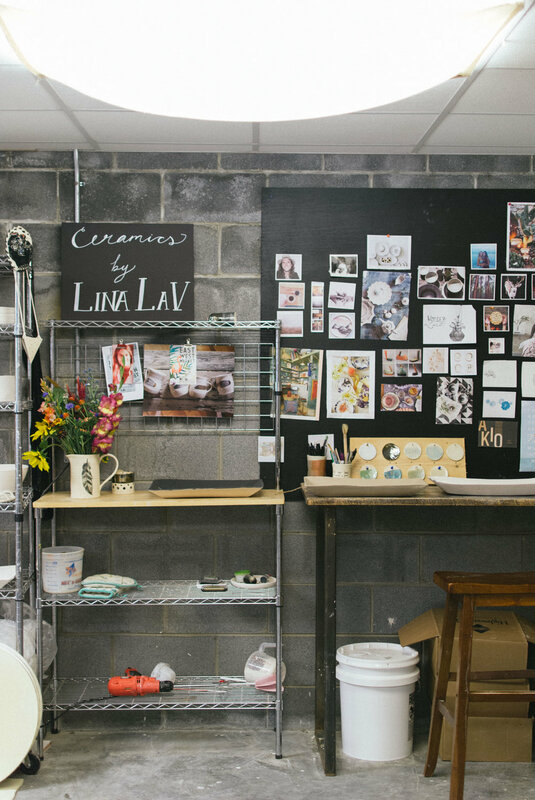 Today I'm sharing photos of the workspace of Melina of Ceramics by Lina LaV. My husband and I first saw her work at one of the Vintage Charlotte pop-up markets a while back and have loved following her beautiful work on Instagram ever since. I especially wanted to create an opportunity to feature a ceramicist in this series because I took a ceramics class in high school (almost ten years ago!) and have really been in love with it ever since. My husband has also taken several semesters of ceramics classes in the past couple of years, and it's just such a fascinating art form to me. In addition to her beautiful work, another thing that specifically drew me to Melina is that she's also a mom. I feel like it took a while for me to figure out how balance life, work and art after having a baby - in fact, maybe I haven't even fully "figured it out" yet, since it's constantly changing! For the longest time I felt like I was just fumbling forward, always busy, always juggling random things and multi-tasking, hoping that I wasn't dropping anything. It can feel a little chaotic at times, but simultaneously wonderful. Melina had posted this fantastic photo on Instagram of her rocking her son, Lucca, with one foot, while using her other foot on the pedal of her wheel to throw and I immediately thought, "Yes! This is the perfect portrait of motherhood." Okay! I'm going to stop talking so we can dive in. Here's Melina! 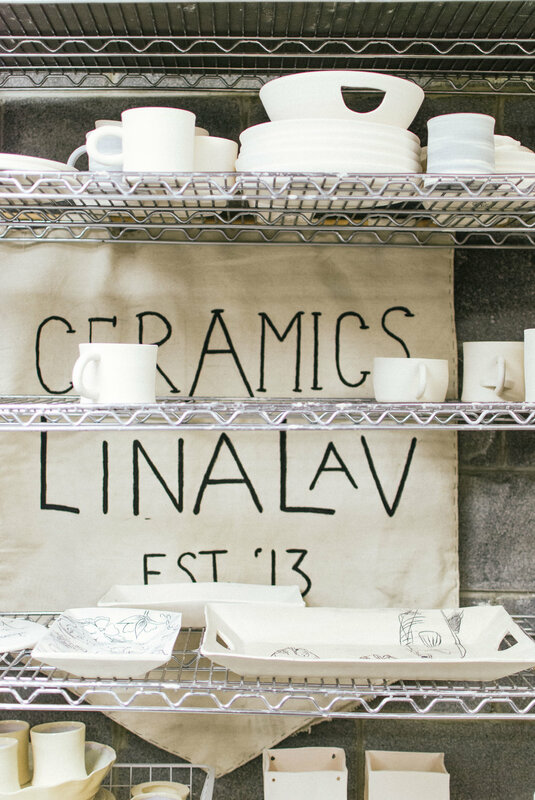 Tell me a little bit about Ceramics by Lina LaV! Ceramics by Lina LaV started in 2012 in college. 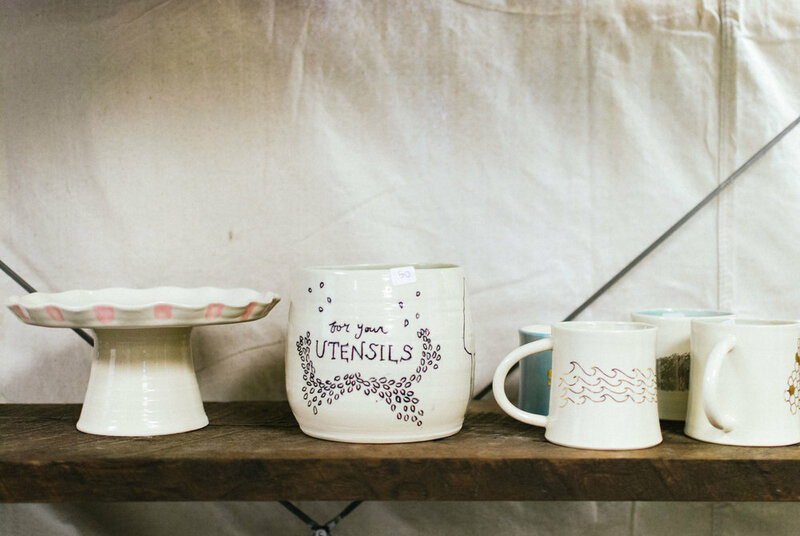 I studied ceramics as a concentration for my Art Education degree... I was horrible at it! I literally cried at the wheel and begged my now husband to pray that I can magically throw 20 cylinders. 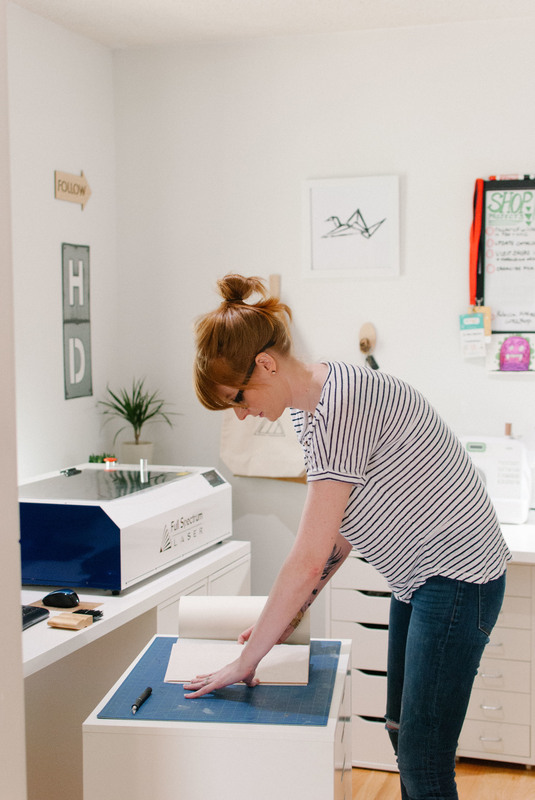 I took a leap later that year and bought a fully equipped studio from a gal off craigslist! 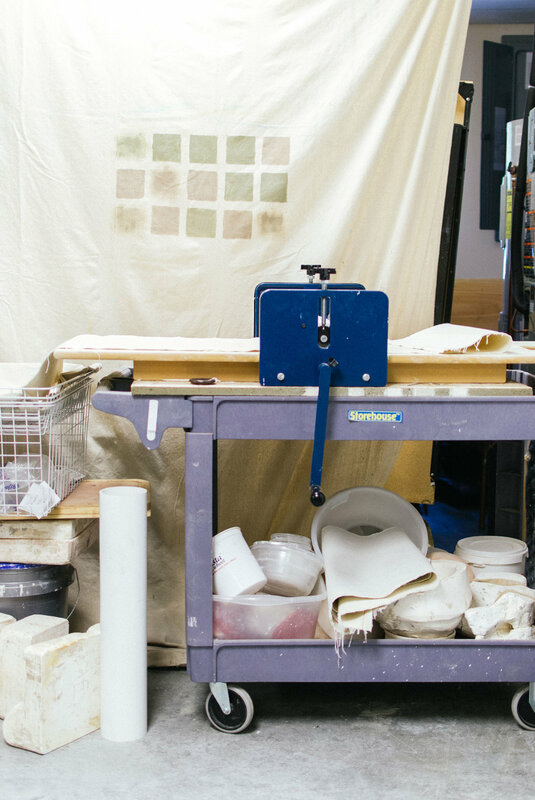 I made the decision in a day and found a loan for $4,500 that included two kilns (one is priced at $4,000), a wheel, a slab roller, multiple shelves and tools. I spent countless hours in a dark, wet basement throwing pots until I proved to myself that all my professors were wrong and that I could throw lite and beautiful and even! A couple years later I started an Etsy shop and have been working ever since. 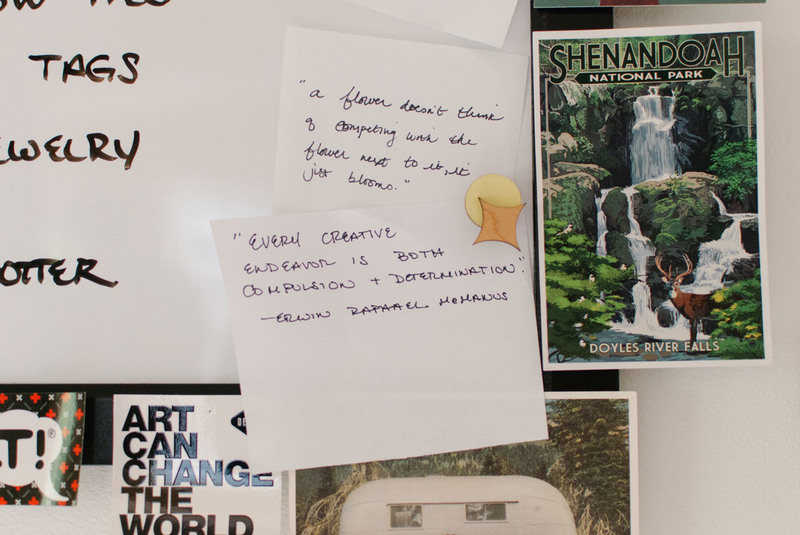 I was really drawn to the inspiration wall you have in your studio and I spent so much time looking at all of the images you have pinned on it. 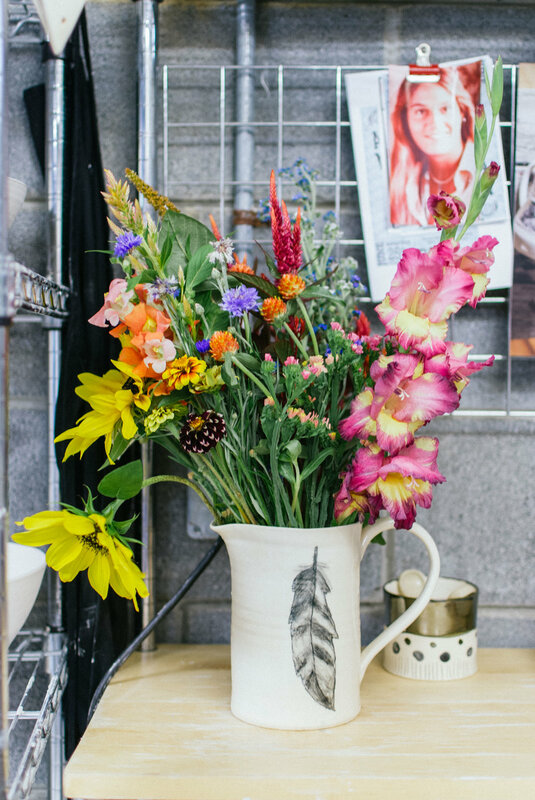 Can you tell me a little bit more about what keeps you inspired now, and what initially inspired you to even get into ceramics as a medium? I love this question. My history in creating always leads back to my parents, two chefs that met at culinary arts school in Charleston. I grew up with the most extravagant dinners. My father is Italian and my mother is a designer. They would start cooking after church and tell us to invited anyone we wanted over for Sunday dinners. These were extra special and usually included multiple courses, candles, music and lots of dessert. I watched my mother set the table with particular attention to the tableware, the plates, the glasses, the linens, the sterling silver, the placemats, the flower treatments... She didn't care if it was just us, she would go all out all the time because she loved beauty and she loved creating something out of nothing. I will always remember these moments. My father is an amazing chef and would only cook on Sundays. He always said the plate should act as a canvas for the dish, making the food look beautiful and refined. They are my muse. I hope my pieces inspire others to bring out the best for each and every meal, treat it as if it's your last, invite the whole neighborhood over and spend time sharing dreams, thanksgiving and blessings over each other. What inspires me now is that the slow-living movement is returning to how people use to treat life. They would grow their own food, cook their own meals, eat whole and purely and invite everyone over to their homes for supper. I can't disconnect food and meals with dinnerware and kitchenware. You need them to serve the food, which in turns serves others. 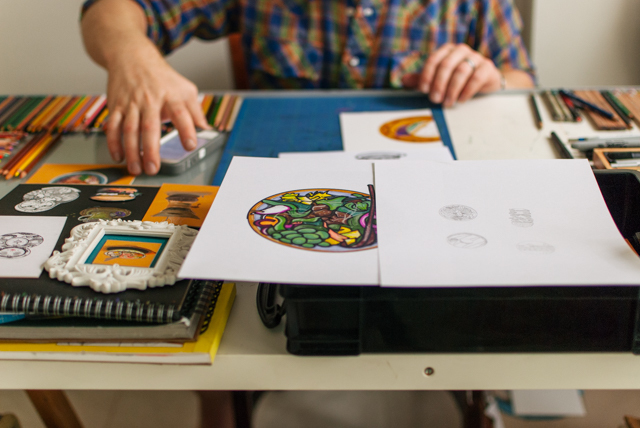 I have noticed that the majority of your work is specifically tableware (plates + platters). What made tableware become sort of your main focus with your ceramic work? I think I answered this question a little bit above. However, I will rephrase, that I was never drawn to the sculptural hand building methods of ceramics. I prefer throwing and hand building functional, yet aesthetically-minded pieces. 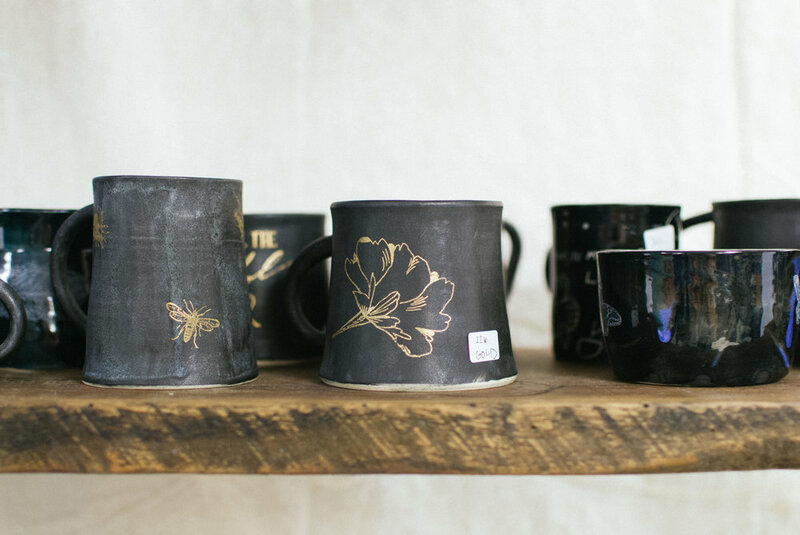 Pieces that are so beautiful you want them to sit on the shelf, but I'm (secretly) forcing you to use them everyday. 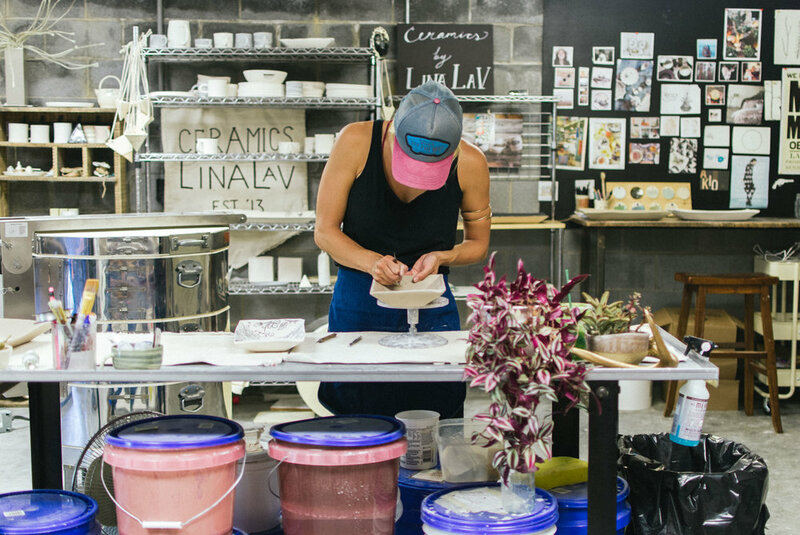 I know that for some different art forms, you don’t necessarily need to invest in a whole lot of equipment to get started, but ceramics is an entirely different story! What was your “aha!” moment like where you decided to go ahead and take that leap to buy the equipment and set up a studio in your house? One random day I decided that I would look up ceramic studios on craigslist, and found this fully equipped studio that a retired woman was selling. She posted it not even an hour ago and I was the first person to call (nearly a hundred people inquired). I told her my heart and dream for opening a studio and she said out of all the people she felt like I needed to have it... I also prayed that God would give me a studio... I thought this dream was literally 10 years down the road but He had other plans. 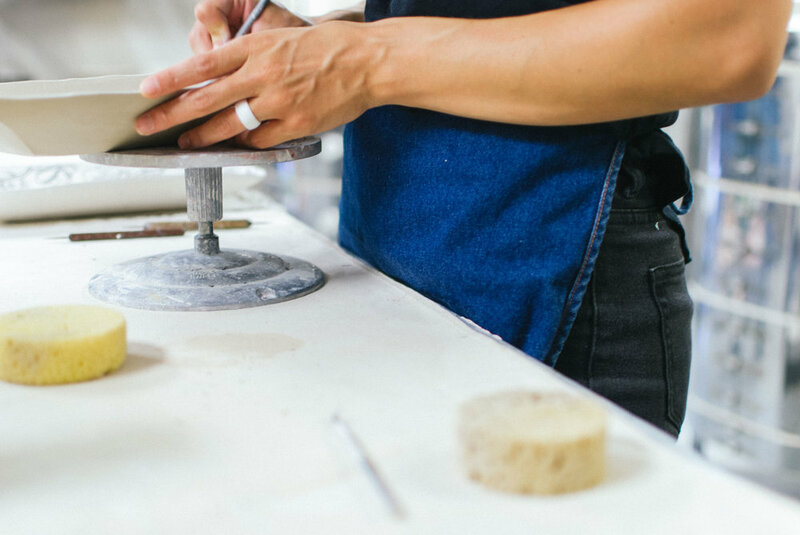 I love the aesthetic of the gold designs on some of your pieces, which I didn’t see many other ceramicists doing; what sparked that idea, and what kind of a process does it involve? Gold is very trendy in the ceramic world these days. I certainly did not start the trend, however I think that I am the only one (that I've found ) to get some of my original designs made into real 22k gold silk-screen transfers. I love the use of precious metals in something so non-precious, MUD! It's a captivating oxymoron. You and your husband are both full-time artists, which I find to be incredibly inspiring because it can be so scary to take that leap to do art (or really whatever you’re passionate about!) full time. What kind of advice do you have for any artists out there who are considering taking that same leap? Don't give it 5 minutes if you don't plan to give it 5 years. I don't know who said that to me but it has always stuck. Also, don't put so much pressure on yourself. My husband paints full time but I work in my studio in the day and I bartend 2-3 nights a week... primarily because I love the hospitality industry and my family raised me in a some-what workaholic atmosphere... but it is a good break for me when I am tired of being by myself all day, vise versa, around people too much, I escape to my studio to work by myself. One more thing, just do it! Commit fully and if you need to change your lifestyle, eat beans and rice or adjust in other ways that make the risk less scary and more realistic. I always think if you follow what you truly love to do in life, the money will find its way to you... and trust God. I'm so excited to finally share the second installment of the "In Their Element" series I've been working on to feature artists and the spaces they create in. If you didn't catch my first installment of this series back in January, you can view it here. Tell me a little bit about Havok Designs! 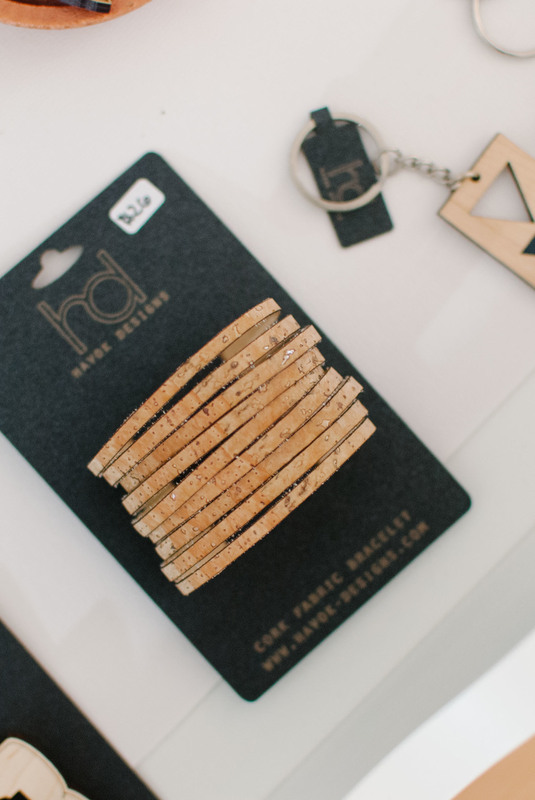 Havok Designs specializes in laser cut wooden jewelry, cork wallets, home décor and custom work. Havok happens in the space between the before and after. It's the process, the metamorphosis from something raw to something refined. At Havok, we believe there to be a strong connection between humans and wood: that it’s a part of our history and our foundation as people. Our ancestors built houses, bridges, furniture and tools out of it. Our products represent this innate connection and maintain the relationship between the two. How did Havok Designs come to be? Were you first drawn to wood as a medium or jewelry and fashion accessories as the product, or did they always go hand-in-hand to you? I had recently graduated from college with my art & design degree and knew that I wanted to start a company and work for myself. My husband's hobby was CNC woodworking at the time, which wasn't always congruent with the harsh winters of Montana, where we were living at the time. So we decided to purchase a laser engraving machine which could be used indoors. Once we started working with it, we quickly decided that wood was the preferred material choice, and the designs started to flow at a rushing pace. I was quickly surprised at how many of my initial designs were jewelry and accessory items as that type of design was something that I had never done before. But it just seemed to make sense, and since it all came organically, we just went with it! 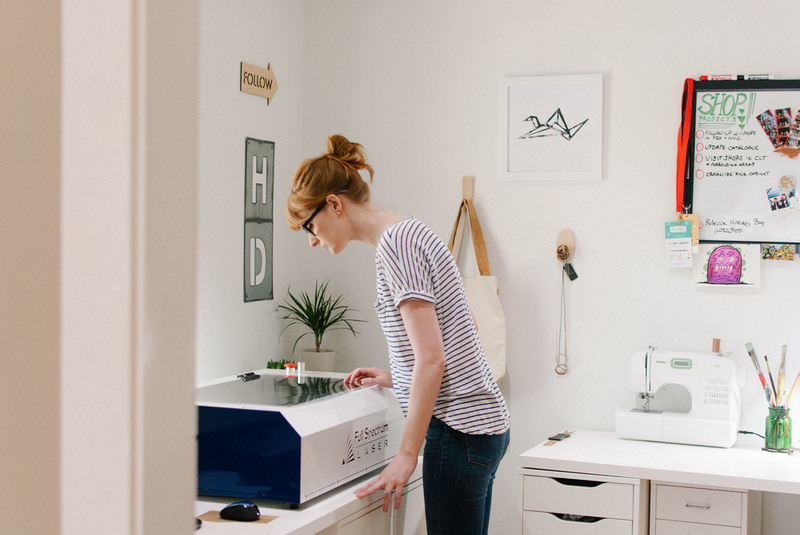 Not a lot of people are familiar with the process of making laser cut pieces. What is that process in a nutshell, because I know after visiting your studio that it is so much more involved than it looks! It’s a lot of technical stuff mixed with graphic design stuff. But the first step is to create a design and then digitally convert that design using computer software to best communicate with the laser engraver. 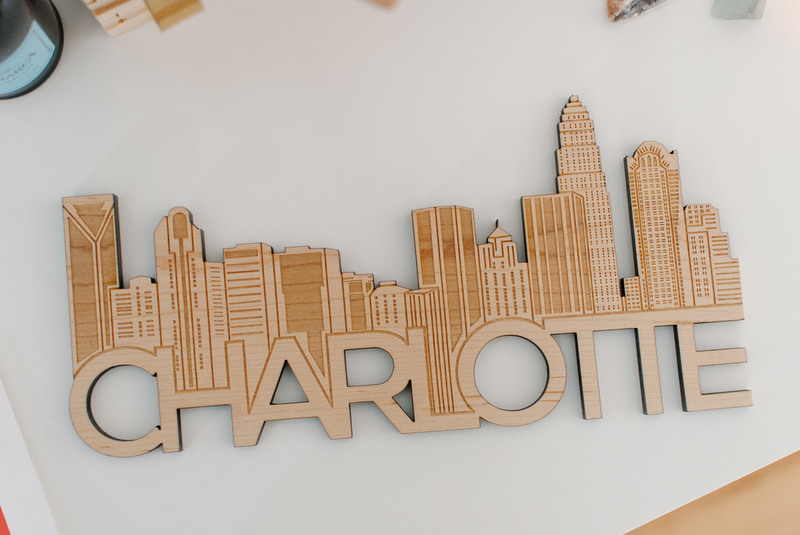 Once the design is converted and sent over the laser software, you input the correct settings to tell the laser to either engrave or cut for each layer, line, or shape, insert your material and line it up properly inside the machine, and press go. The laser uses that information to engrave and cut out your design from your preferred material. And that’s it! You said one of your most popular pieces is the origami cranes. What was the inspiration behind those? 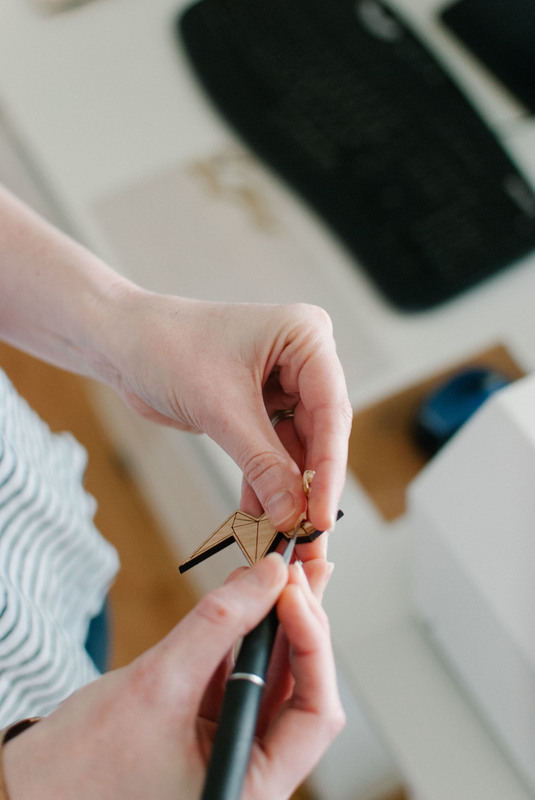 My husband and I had watched a really great documentary on origami and the art of paper folding, and one of the people being interviewed said something that really stuck with me. He said that when you fold a piece of paper, you in effect change the memory of the paper itself. I couldn’t get that whole idea out of my head and I started drawing origami cranes in various parts of flight over and over. We had just gotten the laser engraving machine so they ended up being the very first things that we ever designed and cut out for Havok Designs. And though the size and quality of the cranes we make now are way above what the first set was, we still like to keep it on our fridge as a reminder of our very humble beginnings as a company. 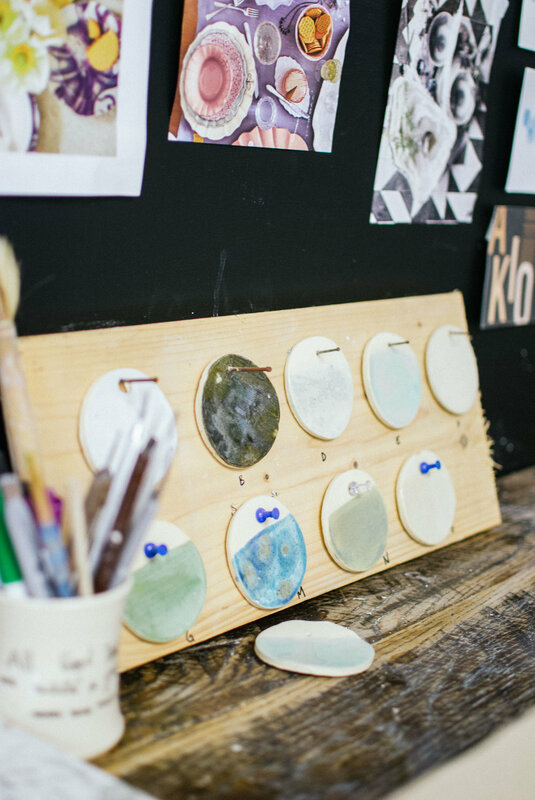 What do you love the most about your studio space and how have you made it an inspiring place to create in? My main goal when creating this space was to maximize organization. The last studio spaces consisted of makeshift furniture we built out of leftover lumber from a barn when we were living in Montana and there was absolutely zero storage! The wood, shipping materials, and packaging were everywhere making it a really distracting place to work. 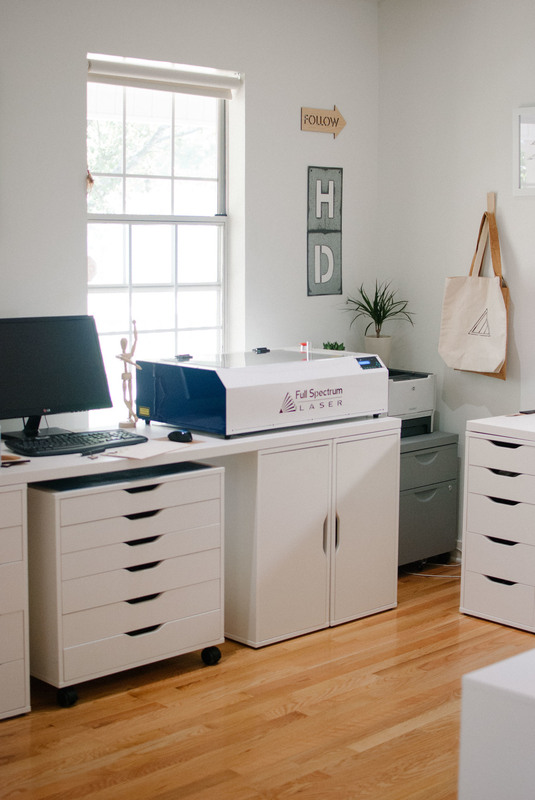 So when moving into this new space, I wanted it to be clean and uncluttered so that work would come more easily without a bunch of interference around. It’s also a small space so functionality was at the forefront of my mind as well when designing this space. So I chose IKEA pieces that work well together, provide maximum storage, and can be hidden within each other. The cabinets are on wheels, can work as extra work tables, and also can slide underneath my larger, longer desks and workstations when not being used. 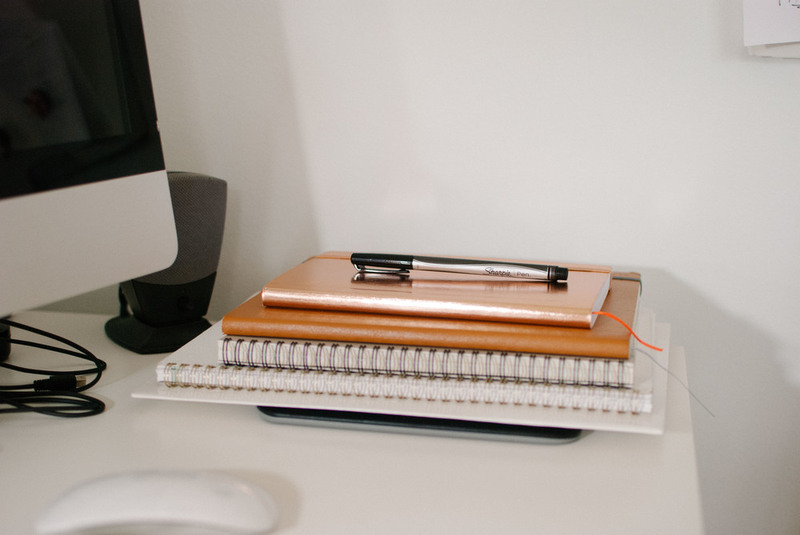 They also hold all of the wood, acrylic, card stock, and inventory within their drawers so everything has a home keeping the clutter to a minimum. Another thing that I love is that everything is white and it’s easy to add pops of color with artwork, plants, and our wall hanging designs. 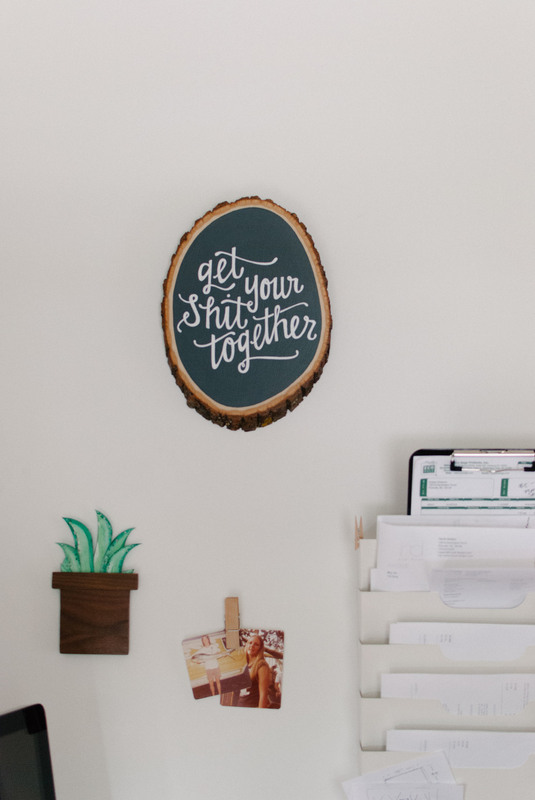 I’m constantly moving things around on my walls on a whim to freshen up the space when my mind needs it to happen. I love that your work is so versatile, that it’s not just restricted to jewelry but also functional pieces like bags, clutches, iPad sleeves, and home accessories. What are some new designs + ideas you have in mind for future products? We are really on a home decor kick right now and are also loving layering various natural materials together. So for instance, we’re doing more layering of the cork fabric with wood to create jewelry pieces with cork fringe hanging from wood pieces and handbags with wood handles and cork fabric bodies. Along with that, we are also doing some layering with smaller pieces like quartz crystals, black tourmaline, and other stones adhered to the tops of wood rings for a really unique statement. Since we use all natural materials, we are always looking for ways to highlight their innate beauty which continues to allow each piece to be distinctive in its colors, grain, and characteristics. The main goal is to continue to create functional, beautiful products that stand out from the crowd and look beautiful on you or in your home. I've been working on a series that I'm really excited to share. This series will focus on artists and the spaces they create in. 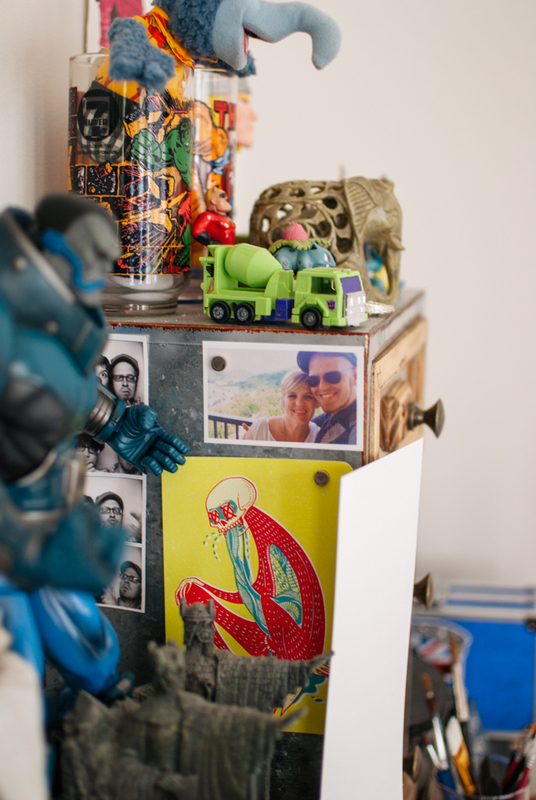 I've always been intrigued by the workspaces that creative people have and I think photographing these spaces is an interesting way to get a behind-the-scenes feel for the artwork that is created. I feel that, in their own way, these spaces share a bit of the creative process behind the art in a way that words can't. I have titled this project "In Their Element." Tell me a little bit about the Ruminate project! Ruminate is a showcase depicting artistic representations of some of the best restaurants and chefs in Charlotte. Cece Stronach and I teamed up to bring the signature dishes and beverages to life through our various mediums. We reached out to Heirloom in Davidson, The Daily Press in NoDa, Futo Buta in South End and many others and they loved the idea! I look forward to a continued partnership with these amazing culinary magicians somewhere down the road. 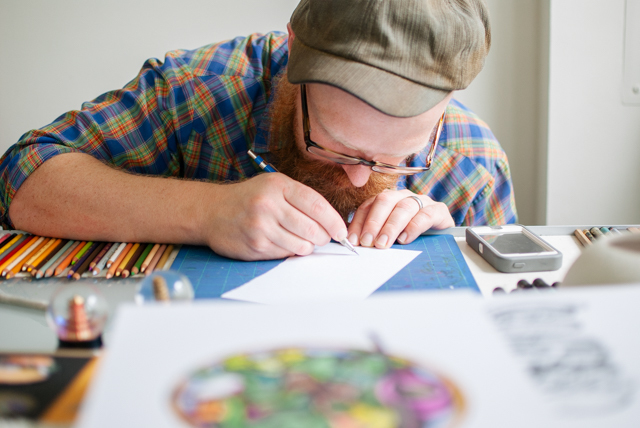 I noticed that many of your drawings are on scrap pieces of paper or on matte boards. Can you share the reasoning behind some of the paper and surfaces you use? For the longest time, I was held hostage to the ‘perfect format’. I was always looking for some magic substance that would make me a better artist. Some material that would be able to interpret what my mind’s eye was trying to communicate. The breakthrough moment came when I bought a huge piece of orange mat board to frame a print my wife found for me. I found that drawing on the scraps was liberating. There was no pressure. No expectation. That's the moment that I truly understood that it's a poor craftsman that blames the tools. You told me that you always have a copy of The Wild Muir on your drawing desk. What is the significance of this book to you and your work? John Muir and his life constantly stand as evidence to me, that if you're going to climb the mountain, weather the storm or fight the bear: You need to abandon the plan sometimes and just make the thing happen. He was a stubborn mule of a man and he answered to his environment. He reminds me that I should adapt to my surroundings instead of asking them to adapt to me. One of your daughters (age 7) has turned into quite the little artist herself and even had one of her pieces showcased at the Ruminate show. How do you find ways as a parent (and an artist!) to support her in her creativity? Limitation is the greatest inspiration to me. With Lily, I do my best to provide her with a variety of tools at her disposal. I ask her to look for the opportunity in what is in front of her and to never become paralyzed with what she or others say can’t be done. Working with what you have is the key to success and she makes use of everything around her. If everything is a canvas, you are never without tools. Your home is one that I could spend hours in, looking at all of the photos, books, projects, and plants. In what ways does your environment inspire your work? Our home is curated by many standards. It's critical to the process to keep your vision in front of you. I must keep my projects visible and tangible or I move on. Most time at the peril of my extremely understanding Wife. The photos remind me of what I'm working for. The books are there to fuel and inspire the fire. Whenever I'm stumped and whenever the lines don't make sense, I take a moment and pick things up and rummage through our galleries and after I'm distracted and spend some time elsewhere for a bit am I able to return to my desk and get back to work. What’s next for you now that Ruminate is over? Will you continue to draw food or do you have another theme up your sleeve for a series you would like to start next? I believe I'll always draw food. It's vibrant and elemental and has so much value that I can't ignore it. That being said, my next project is already in the works. My next gallery will be inspired by the flora and fauna of North and South Carolina, particularly the insects and arachnids that surround us. I don't know where it will be shown. I'll figure that out later. I just know that I must create it.